Woo! Thanks for this week's link-up! "Rosemary Walk" is about a beautiful trail along Mobile Bay. Inspired again by Javacia to create an editorial calendar for the blog. 6. Project Bulk - How stress is a killer, and how to fight back. 7. 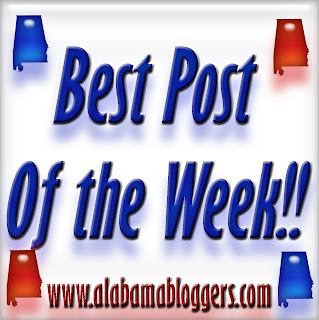 Birmingham Blogging Academy - On customer service, Facebook and being featured in the Montgomery Advertiser. 9. See Jane Write - A plug for Javacia's feature story on me and Y'all Connect, plus a can't-miss event on June 21. Mine's a simple letter to a manatee tank diver in 1997. That's pretty normal, right? Virtual 5k fun!!! You all should join next time!